The third stage was the last chance for the sprinters to show their sprinting skills in this year’s Tour de Pologne. Like in the previous days, the BORA – hansgrohe train, with Cesare Benedetti at the front of the peloton, led the race and brought their leader into position. Unfortunately, having ridden the perfect race, the German Champion was boxed in during the final metres and could not start his sprint seeing Á.J. Hodeg take the win and also taking over the leader’s jersey. The third stage took the riders from the Stadion Slaski to Zabrze over 139km. Today’s stage favored again the fast wheels in the peloton with only some hilly sections and a flat finish. 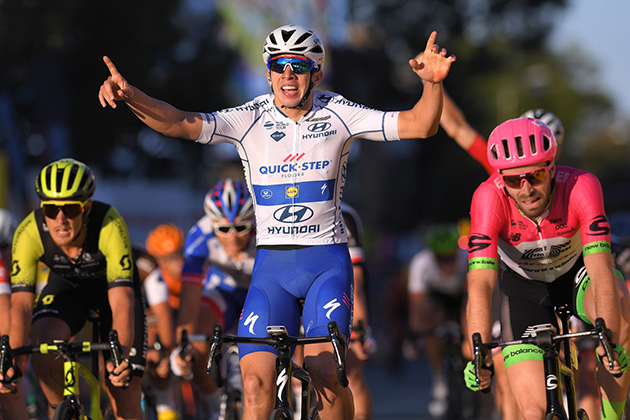 The stage included one category four climb and three intermediate sprints, before the race headed into the final laps in the city of Zabrze. The team knew the finish from last year’s edition, where BORA – hansgrohe rider Peter Sagan took third. The whole team supported again their leader Pascal Ackermann in today’s finale, to achieve another stage win. Like in the previous days, the team focused to control the peloton and set the pace. Directly after the start, a group of four riders formed the breakaway of the day with a maximum gap of four minutes. It was BORA – hansgrohe rider Cesare Benedetti, who set the pace in the main field to protect Tour de Pologne’s leader, Pascal Ackermann. With 77km remaining the three escapees were 2:20 ahead of the bunch, but BORA – hansgrohe tried to keep their advantage low and with the gap dropping steadily, it was all back together with 10km remaining. As approaching the finale, the sprinters teams started to form their lead-out. The final laps saw high speed and as the peloton headed into the finale, the BORA – hansgrohe sprinter was in a good position. Shortly before the line Pascal was boxed in by two other riders and couldn’t start his sprint. He took 12th place, while A.J. Hodeg took the win and also the leader’s jersey of the Tour de Pologne. Alvaro Hodeg takes Tour of Poland stage three. Team Sunweb coach Hans Timmermans (NED): "For the TTT and the road race we have a strong team, and for both it's important that we stick to the plan. In the TTT if that means that we win then that's good, but if it's something different then we will also be happy with that as long as we've worked according to our plan. For the road race we have some fresh legs coming out of the European championships, as well as Coryn and Leah, who finished 3rd here last year. The parcours suit us really well and after a good few months we're feeling good about taking the maximum out of this race." Team Sunweb coach Marc Reef (NED): "Our goal at BinckBank Tour is to explore possibilities for a GC result with Søren and look for a result in the sprints with Max. The GC is likely to be decided by the time trial and Flemish stage, but we also have to be careful with the wind in Holland and Belgium. Chris and Martijn will be the guys to support early on, and for the sprints we have a strong lead out with Edward and Michael, alongside our road captain Roy." 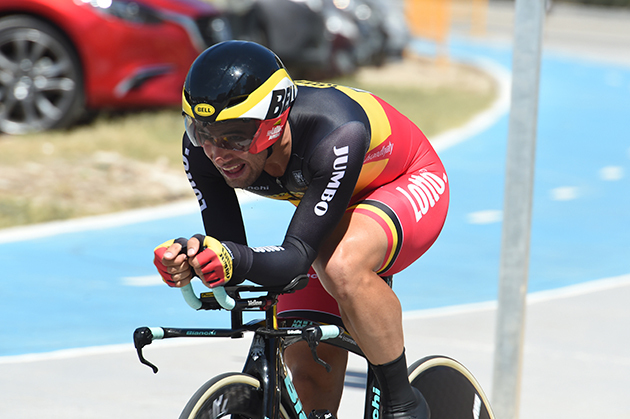 On Wednesday 8 August, Victor Campenaerts will defend his European time trial title in Glasgow. The Lotto Soudal rider is eager to keep his blue and white champion’s jersey, which he earned in the Danish city of Herning last year. Victor prepared for the European Championship at an altitude training camp in Livigno. 06 August, 2018, Santa Rosa, California (USA): Belgian rider Guillaume Van Keirsbulck will join Greg Van Avermaet at Continuum Sports in 2019 to strengthen the team's classics roster, General Manager Jim Ochowicz announced today. Van Keirsbulck is the second rider alongside Van Avermaet to be confirmed with Continuum Sports, currently operating as BMC Racing Team, for the 2019 season when Polish shoe and bag manufacturer CCC becomes title sponsor. "We are excited to welcome Guillaume Van Keirsbulck to Continuum Sports as we believe he will be a valuable addition to our classics team. With CCC joining Continuum Sports as title sponsor in 2019 we will have a new look, a new roster, and new objectives, so this is the first of many rider announcements we will make over the coming weeks," Ochowicz explained. "Guillaume has a lot of experience at the WorldTour level and has demonstrated his abilities in different racing formats, from one-day classics to Grand Tours with two Tour de France participations to his name. With victories at Binck Bank Tour and Le Samyn over the years, Guillaume has shown that he can win races so he will have his own opportunities with us, as well as playing a crucial support role for Greg Van Avermaet during the classics season. As a Belgian, Guillaume is at home on the cobbles and this knowledge will be invaluable for the cobbled classics next year." Van Keirsbulck, 27, turned professional in 2011 and will make his return to the WorldTour after two years with Professional Continental Team Wanty Groupe-Gobert. The opportunity to ride alongside Van Avermaet was too good to pass up, Van Keirsbulck said. "I come from a cycling family and as a Belgian, I love the classics so I am very excited to join Continuum Sports. I am motivated to help Greg Van Avermaet in the classics and to help strengthen the team, and take any opportunities that come my way," Van Keirsbulck said. "I have had the chance to ride for myself in the past two years but in the classics it is a constant fight for position and there is a certain level of respect that comes from riding with a WorldTour team. I'm really looking forward to returning to the WorldTour level to ride for a strong team like Continuum Sports, with Greg as leader." Pierre Latour will be unable to race for four to six weeks. Pierre Latour, the 2018 Tour de France's Best Young Rider, crashed Saturday at the Clasica San Sebastian. In addition to many wounds, a dorsal and thoracic CT scan revealed a non-displaced [cracked, but retains its proper alignment] vertebral fracture, according to Dr. Eric Bouvat, Ag2r's team doctor. He will be partially immobilized for three weeks and then he will be scanned to see how he is recovering.